Our newest addition, THE DESERT OASIS Dual Lane Bounce House and Slide Combo, is the PERFECT inflatable for every event and is a popular rental year-round! The bright colors along with the dual-lane slide make it fun for boys and girls alike. Children can enjoy this combo unit with water for some slip-n-slide action they'll never forget! The Desert Oasis keeps the party moving with less time waiting to slide. 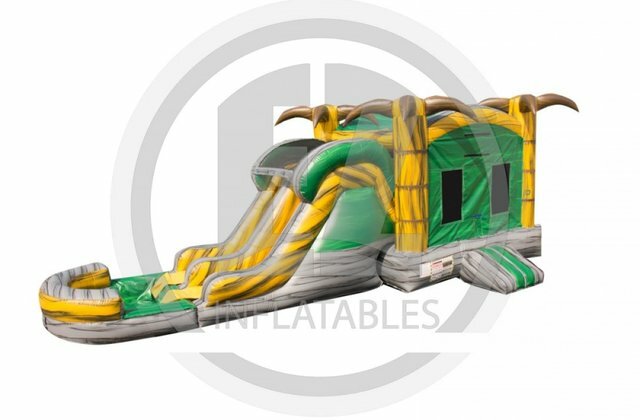 It has large enclosed bouncing area (15x15), with a double-lane slide to double the fun! It stands at a staggering 12 feet tall and has a length of a whopping 33 feet! Reserve yours today!